The first definitive Spanish stamps were issued in January 1850. At this time in philatelic history, Spain became the twelfth country of the World to issue adhesive stamps for the prepayment of letter postage. 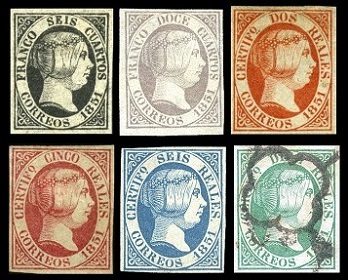 Almost all of the postage stamps of Spain, issued between 1850 and 1869, show the profile of Queen Isabella II. 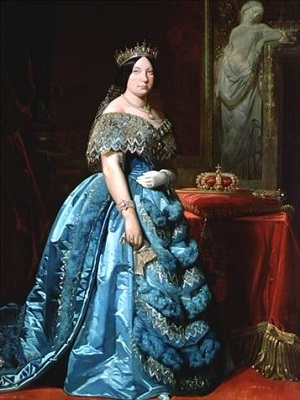 Queen Isabella II (1830-1904) of the House of Bourbon was only three-years-old, when she ascended to the Spanish throne. Her accession was contested by the Carlists, who did not recognize the sovereignty of a female monarch. Her reign survived as long as it did, primarily through the support of the army. This resulted in what are called the Carlist Wars, a series of civil wars fought between 1833 and 1876. As a result of the Carlist Wars, Isabella II was overthrown in 1868, and she formally abdicated in 1870. The five definitive Spanish stamps shown above were issued on January 1, 1850. They are lithographed, unwatermarked, imperforate, and they are all inscribed "1850" at the bottom. Type I - The "T" and "O" of "CUARTOS" are separated (shown above). Type II - The "T" and "O" of "CUARTOS" are joined. 06 C. (1850 - Thin Paper - Type I - Sc. #1c) - Black. 06 C. (1850 - Thick Paper - Type I - Sc. #1b) - Black. 06 C. (1850 - Thin Paper - Type II - Sc. #1) - Black. 06 C. (1850 - Thick Paper - Type II - Sc. #1a) - Black. 12 C. (1850 - Thin Paper - Sc. #2a) - Lilac. 12 C. (1850 - Thick Paper - Sc. #2) - Lilac. 05 R. (1850 - Sc. #3) - Red. 06 R. (1850 - Sc. #4) - Blue. 10 R. (1850 - Sc. #5) - Green. 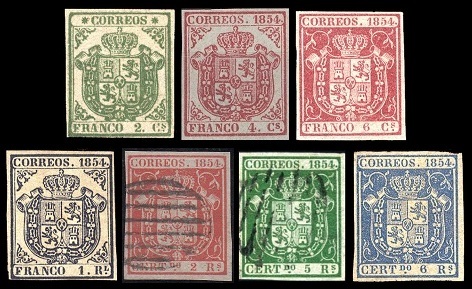 The six definitive Spanish stamps shown above were issued on January 1, 1851. They are typographed, unwatermarked, imperforate, and they are all inscribed "1851". 06 C. (1851 - Thin Paper - Sc. #6) - Black. 06 C. (1851 - Thick Paper - Sc. #6a) - Black. 12 C. (1851 - Thin Paper - Sc. #7) - Lilac. 02 R. (1851 - Thin Paper - Sc. #8) - Red. 05 R. (1851 - Thin Paper - Sc. #9) - Rose, Red Brown (error). 06 R. (1851 - Thin Paper - Sc. #10) - Blue. 10 R. (1851 - Thin Paper - Sc. #11) - Green. The five definitive Spanish stamps shown above were issued on January 1, 1852. They are typographed, unwatermarked, imperforate, and they are all inscribed "1852". 06 C. (1852 - Thick Paper - Sc. #12) - Rose. 06 C. (1852 - Thin Paper - Sc. #12a) - Rose. 12 C. (1852 - Thick Paper - Sc. #13) - Lilac. 02 R. (1852 - Thick Paper - Sc. #14) - Pale Red. 05 R. (1852 - Thick Paper - Sc. #15) - Yellowish Green. 06 R. (1852 - Thick Paper - Sc. #16) - Greenish Blue. The seven definitive Spanish stamps shown above were issued on January 1, 1853. They are typographed, unwatermarked, imperforate, and the higher-denominations are all inscribed "1853". The two lowest-denomination stamps feature the Coat of Arms of Madrid. These two stamps were only valid for local-postage within the city of Madrid. 01 C. (1853 - Thin Paper - Sc. #17) - Bronze. 03 C. (1853 - Thin Paper - Sc. #18) - Bronze. 06 C. (1853 - Thin Paper - Sc. #19) - Carmine Rose. 06 C. (1853 - Thick Paper - Sc. #19a) - Carmine Rose. 06 C. (1853 - Thick Bluish Paper - Sc. #19b) - Carmine Rose. 12 C. (1853 - Thin Paper - Sc. #20) - Reddish Purple. 02 R. (1853 - Thin Paper - Sc. #21) - Vermilion. 05 R. (1853 - Thin Paper - Sc. #22) - Light Green. 06 R. (1853 - Thin Paper - Sc. #23) - Deep Blue. 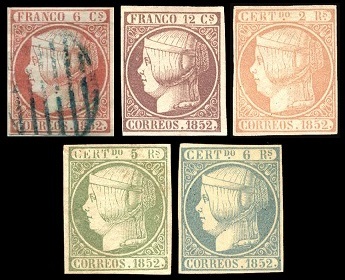 The seven definitive Spanish stamps shown above were issued during 1854. They are typographed, unwatermarked, imperforate, and, except for the 2 C. denomination, they are all inscribed "1854". These new definitive stamp designs feature the Spanish Coat of Arms. 02 C. (1854 - Thin Paper - Sc. #24) - Green. 02 C. (1854 - Thick Paper - Sc. #24c) - Green. 04 C. (1854 - Thin Paper - Sc. #25) - Carmine. 04 C. (1854 - Thick Paper - Sc. #25a) - Carmine. 06 C. (1854 - Thin Paper - Sc. #26) - Carmine. 01 R. (1854 - Thin Paper - Sc. #27) - Indigo. 02 R. (1854 - Thin Paper - Sc. #28) - Scarlet. 02 R. (1854 - Thick Paper - Sc. #28c) - Scarlet. 05 R. (1854 - Thin Paper - Sc. #29) - Green. 06 R. (1854 - Thin Paper - Sc. #30) - Blue. 02 C. (1854 - Thick Paper - Sc. #31) - Green. 02 C. (1854 - Thin Paper - Sc. #31b) - Green. 04 C. (1854 - Thick Paper - Sc. #32) - Carmine. 04 C. (1854 - Thin Paper - Sc. #32c) - Carmine. 06 C. (1854 - Thick Paper - Sc. #32A) - Carmine. 06 C. (1854 - Thin Paper - Sc. #32d) - Carmine. 01 R. (1854 - Thick Paper - Sc. #33) - Pale Blue. 01 R. (1854 - Thin Paper - Sc. #33a) - Pale Blue. 02 R. (1854 - Thick Paper - Sc. #34) - Dull Red. 02 R. (1854 - Thin Paper - Sc. #34a) - Dull Red. There were four major obliteration types used during this period. 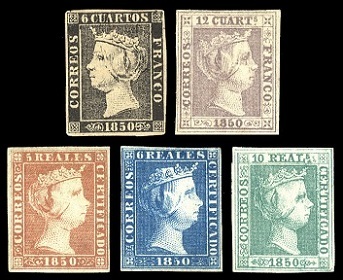 The spider type cancellations were used on the 1850 and 1851 issues of Queen Isabella II. One is shown in the image of the 1851 issues at the left. 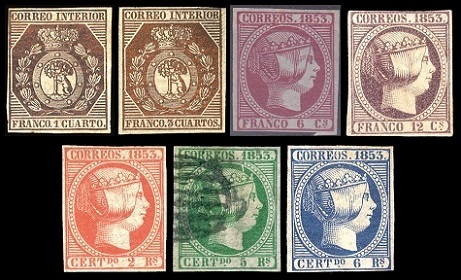 The grid type cancellations were used, beginning with the 1853 issues of Queen Isabella II. The grid type cancellations are very common. Some grid cancellations are shown in the 1852-1854 images at the left. Circular date stamp or town cancellations appear all during this period, but they are scarcer than the grid or spider cancellation, and they usually command substantial premiums. Stamps of 1854 to 1882 that are canceled with parallel horizontal bars or lines are REMAINDERS. Though these are the original stamps, these remainders are worth only a tiny fraction of the prices of the original stamps with contemporary postal cancellations. This can be good for collectors with limited budgets though. Stamps with remainder cancellations can enable one to acquire some very expensive Spanish stamps at very cheap prices! The early definitive stamps of Queen Isabella II are tremendously expensive in mint condition. Even many of the used condition stamps are rare and expensive in their own right. As with anything of great value, there have been people throughout history that seek to profit by deceiving unsuspecting collectors. There are forgeries and unofficial reprints of almost all the early definitive postage stamps of Spain. One should be very careful, when buying any expensive classical postage stamps. It is a good idea to only purchase such items that are clearly authenticated or certified. Note: Most of the images of the stamps on this page are of certified examples found on the websites of major auction houses.